It’s not easy. There’s not one magic solution. 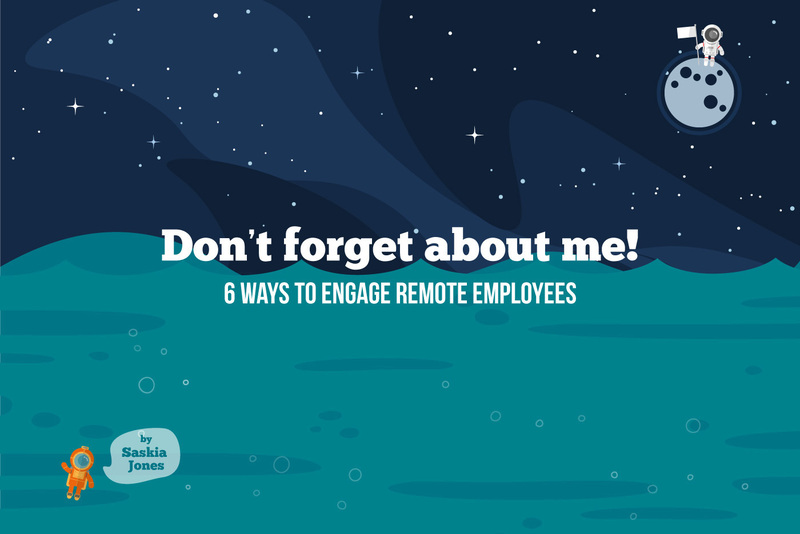 But I’ve found these six techniques make all the difference to engaging remote employees. 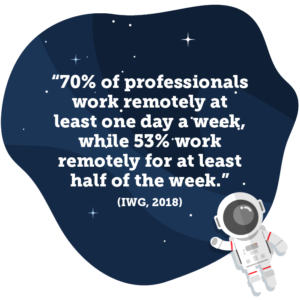 70% of professionals work remotely at least one day a week, while 53% work remotely for at least half of the week, according to IWG in a report from May 2018. Whether they’re desk-based, working in a factory, or on the shop floor, engaging remote employees is vital to the success of an organisation. But as internal communicators, where do we begin? Perhaps you have employees across multiple countries, speaking multiple languages. Perhaps you have a large fleet of drivers. Or maybe you employ a lot of workers who by necessity or free choice work outside of head office. With the huge increase in workplace technologies available, it’s tempting to think that investing in a new digital tool will be the key to engagement. But success will never come from the tools alone. It’s about focusing on your objective and what your audience want and need. 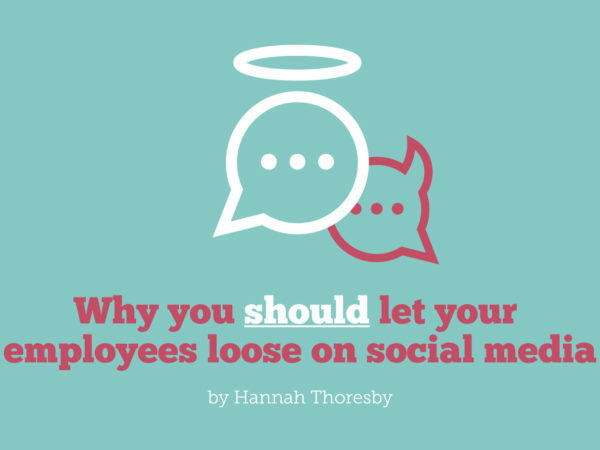 I’m therefore not going to suggest you dive straight in with buying an employee app, creating a global newsletter or starting a webinar series to solve engagement challenges. This will boost pride in the business, foster understanding of the organisation as a whole, and help employees be better advocates for the brand. Get remote employees involved and contributing. From live online chats with global staff and leaders, to a feedback request via your company magazine, to an ideas-generation scheme – there are so many ways and reasons to ask. 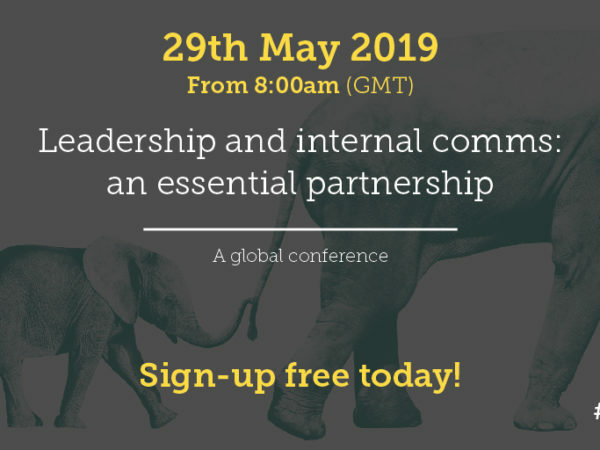 Valuable information can be gathered on how to improve processes, enhance the customer experience and better deliver the organisation’s goals. Just make sure you action responses – showing what you’ve heard and done as a result. Do remote employees want to hear more from leadership? Do they understand the company strategy? What channels work best for them? They might be feeling overwhelmed by too much communication, or feeling isolated and disconnected. Without research, you won’t know. 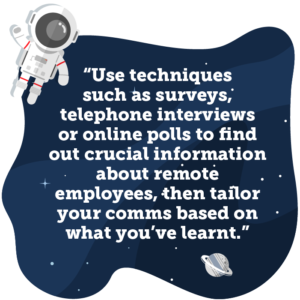 Use techniques such as surveys, telephone interviews or online polls to find out. Tailor your communications to different regions, branches or roles, based on what you’ve learnt. Countless research studies have shown that face-to-face communications are the most powerful and engaging. One study found that moments of conversation between co-workers increases performance by 20%. 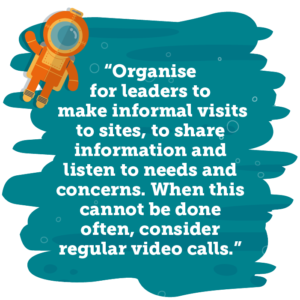 Organise for leaders to make informal visits to sites, to share information and listen to needs and concerns. When this cannot be done often, consider using regular video calls, or video conferencing. 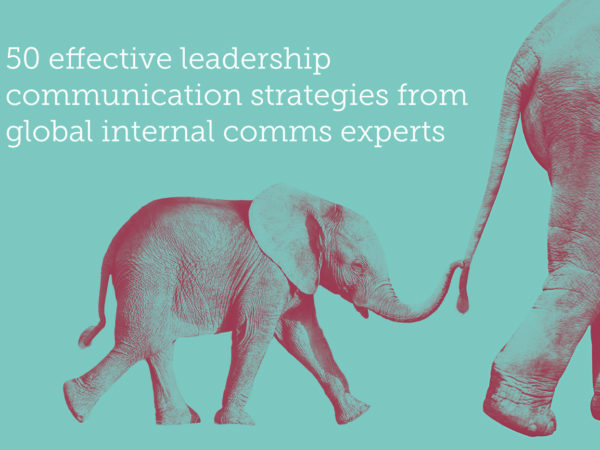 Global comms from head office aren’t always going to hit the mark. Employees want information that is personal and relevant to them. They need to know how they fit in, how they add value and how their team is performing. Managers are best placed to solve this, but often feel too busy. Give them tools and ideas to help. A ‘Managers’ Pack’ can work well on a specific topic – providing key messages, communication guidelines, and an example session plan to help them spark conversations and support their team. 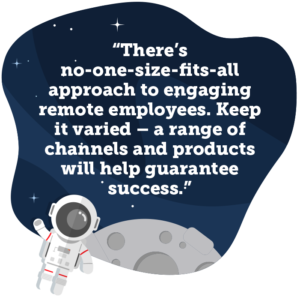 There’s no-one-size-fits-all approach to engaging remote employees. Keep it varied – a range of channels and products will help guarantee success. Some will like a podcast they can listen to whilst on the road; others will prefer a printed document they can take away and read. Get creative with the way you communicate – make it fun and different to cut through the ‘noise’. Just make sure you’re always driven by your objective to engage, and not driven by the need to populate all of your products or channels (such as newsletters, intranets, digital signage) all of the time. Boosting engagement with remote employees isn’t simple. 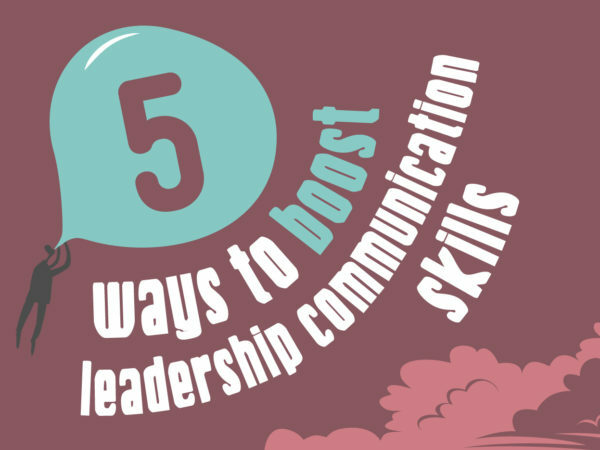 But with these six steps, you’ll be sure to help them feel valued, included and heard. 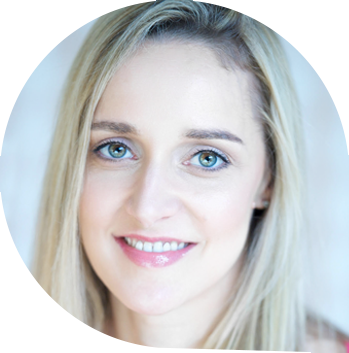 I am a Communications Consultant and Coach, specialising in internal communications and advising C-suite executives. My latest role was Head of Communications Engagement at Oxfam, responsible for brand, strategy and global internal communications. I have been awarded ‘Internal Communicator of the Year’ at the Institute of Internal Communication Icon Awards. …why not download our ‘Anatomy of an Engaged Employee’ IC Field Guide to get the lowdown on what employees really want when it comes to creating a stand-out workplace experience? Got an inspiring idea you’d like to share? If so, we’d love to hear it! We accept guest blogs on any subject related to IC and employee engagement – so if there’s a burning issue you’d like to shout about, just get in touch!